Having coached swim team, and teaching children swim lessons as well as adult private lesson for 7 years I must say that water safety is something very important to me. Living in Oregon we are surrounded by water, every year their are stories of children, adults, and pets who drowned. Many of the stories seem to involve someone doing something stupid like swimming, drunk, at night or cliff diving without checking for obstacle in the water, or the depth. But their are also stories of people being safe, following the precautions and then simply having an accident. See my post yesterday for water safety tips. All dogs can swim instinctively and begin paddling when they end up in water, however for some dogs this is the extent of their "swimming". They waste energy with inefficient paddling, and tire out quickly due to bad swimming form. And just because they are paddling doesn't mean they know how to move towards shore or the pool edge. Ever swam in place? Yup, for some dogs that is it. We go swimming a lot in the summer, most of the time we hit the rivers because we don't have a pool for the pups and the lakes tend to break out in toxic algae, the river is a great place to cool the dogs and get some exercise in. When swimming with our dogs I like to encourage proper form, guess that's the swim instructor in me! 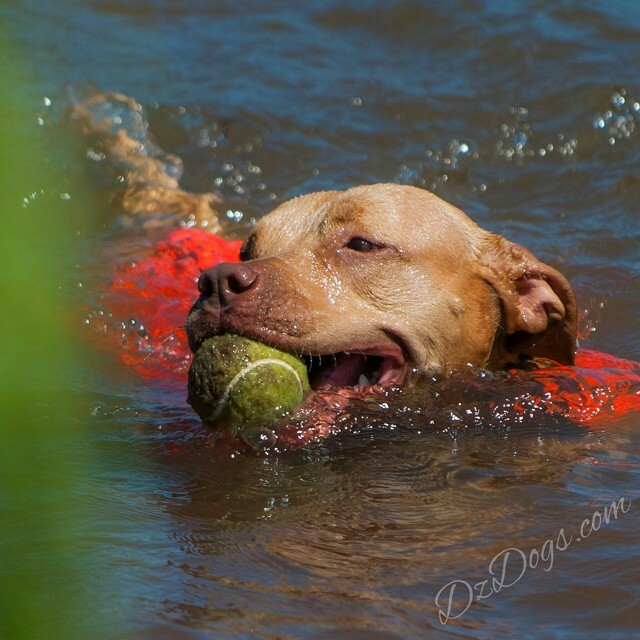 Proper swim form for a dog should be a nice horizontal line along the water's surface. A life jacket is a great way to encourage/teach form, it also helps breeds that are not known for swimming to not struggle and work as hard to stay afloat. Dogs such as Labrador Retrievers, Golden Retrievers, Chessies, Standard Poodles, Irish Water Spaniel, Irish Setter, Newfoundland, and Portuguese Water Dogs and many others are known to be good swimmers, they have water resistant coats, and webbing between their toes. Breeds that are heavy in the front with muscular chests and small hindquarters such as the boxer dog, short muzzled dogs and brachycephalic breeds like Bulldogs, and Boston Terriers may enjoy swimming but don't tend to do well in the water because they tire quickly. And certain smaller breeds like Dachshunds with their longer bodies and short legs, have a hard time staying afloat, they tend to be frightened of the water, and chill easily. Ziva does not swim well, we started off by purchasing a neoprene doggy vest to keep her warm because she chills easy, however this did not help improve her swimming form and she was still sucking down a lot of water when she would retrieve her ball. So we finally invested in a life jacket for her. 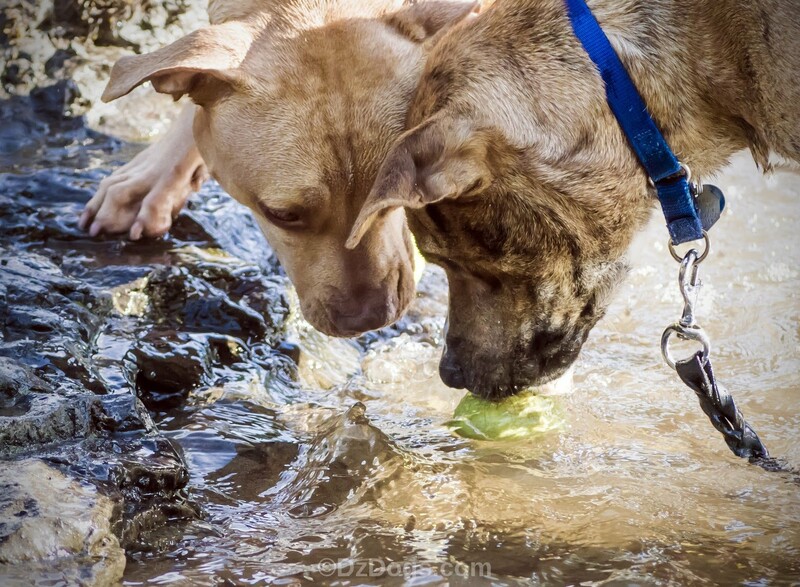 Our dogs swim and hike in their break away collars just in case they get caught on something. I am not a dog life jacket expert! But I can at least tell you what we looked for. Please do your own research when looking into vests, and it is definitely worth the extra dollars for one that fits your dog well and is made with high quality materials and heavy duty stitching. We ended up choosing the Ruffwear K-9 Float Coat, I like it for several reasons. Ruffwear products tend to nicely fit both Dante and Ziva, I know that they materials are high quality and the stitching is sound. 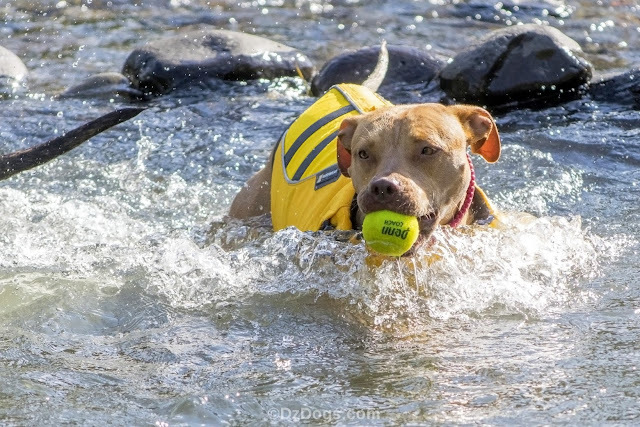 When we tested out the Float Coat, I took Ziva to a fun river spot where she can run across large boulders, jump, and swim next to me in waist deep water. The current is slow and lazy so she could play and get used to the jacket. The Float Coat fit her perfectly, this jacket allows for quite a bit of adjustment across the belly straps but not much for adjustment across the front of the chest so when you measure make sure to fit your pup properly around their neck, you want the life jacket to sit properly across the base of the neck and not be to tight or high. The straps on the belly go over the outside of the life jacket and not across the skin, being a short haired dog chafing happens quickly and easily. In fact no strap touches the dog on Ruffwear's K-9 float coat (great feature). 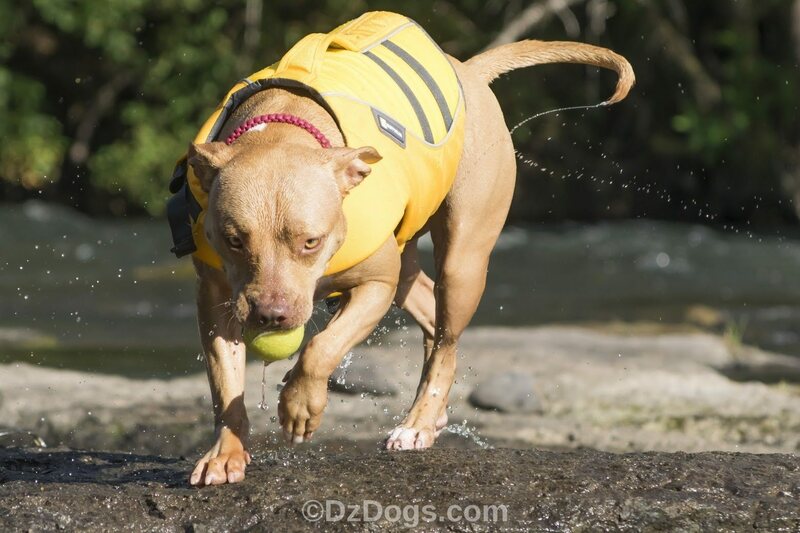 This coat allowed Ziva plenty of movement, we tested it by having her run around on the large boulders and then jump into the swimming area. She could easily run, didn't seem to mind having it on, and she was still able to happily launch herself into the water to chase down her favorite ball. However being a life jacket, it is a bit cumbersome for climbing up and out of the water. Thankfully it has a very sturdy handle built in on top that is designed for lifting your dog, we used this feature once - Ziva wasn't thrilled but I could lift her out of the water with ease and being strapped under her chest and around her belly it did not seem to choke her when she was lifted. Their is also a leash ring attached to the top of the life jacket, and a spot to hook on a flash light or other accessory. Another favorite feature? It is soo bright! 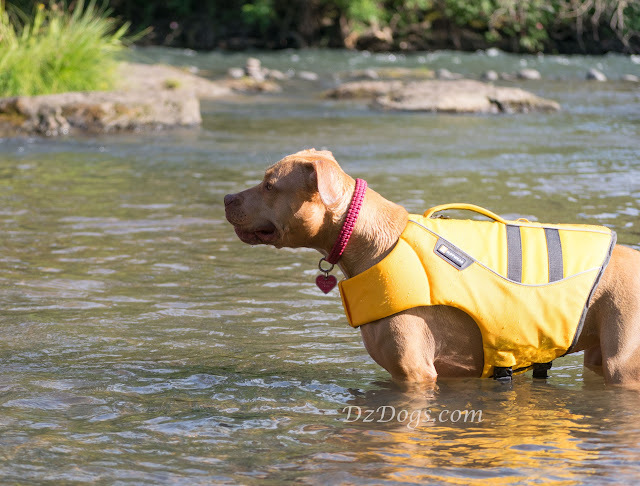 Ruffwear sells their life jacket in two colors, red and yellow. I love the yellow on my little golden girl, she is bright and easy to see. Please be safe this summer! If you are going to be spending much time in the water make sure that you and your pup are properly outfitted, especially when boating or floating the river! Life Jackets for Pets - how safe are they? He would look so dashing in red! Glad we were able to help you! That is a cool swim vest and you look really cool in it! Thanks Hawk! I bet you're an amazing swimmer! Thanks for this - I haven't given this much thought since Jack & Maggie don't swim much, but shared it on FB as it's important.